Raise Funds for your School, Club, or Organization with Nebraska Grown HR Poppin' Snacks Gourmet Popcorn. Let us show you how our delicious products can raise money for your organization. 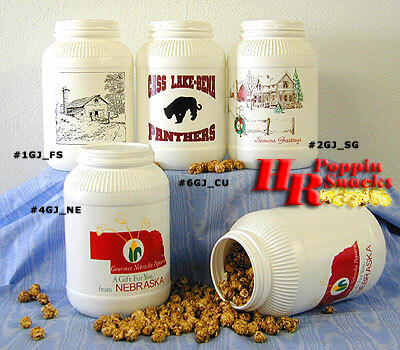 Whether you choose to sell individually packaged gourmet quality popcorn, or customize one-gallon gourmet quality popcorn canisters with your organization logo, school mascot, or company logo, our product will be a smashing success with everyone. You can even design a collectible souvenir canister for that special community event. If you are looking for a way to make FAST MONEY for your organization, we have a popular, profitable and delicious alternative to selling candy, gifts, or magazines. The average American consumes about 60 quarts of popped popcorn per year, why not sell something that people want? We'll even pay the shipping for you. It couldn't be any more simple. We provide you with ready made downloadable materials easily customized with you own organization logo. All the forms you'll need to get your fundraiser started are available at the click of a button. Click here to get started. If you have questions, Contact us today for more information.